I am out for a walk around Rome on the first day of the new year, and I am truly impressed. Sure there is plenty to complain about and tomorrow I’ll be ready to do so, as constructively as possible. 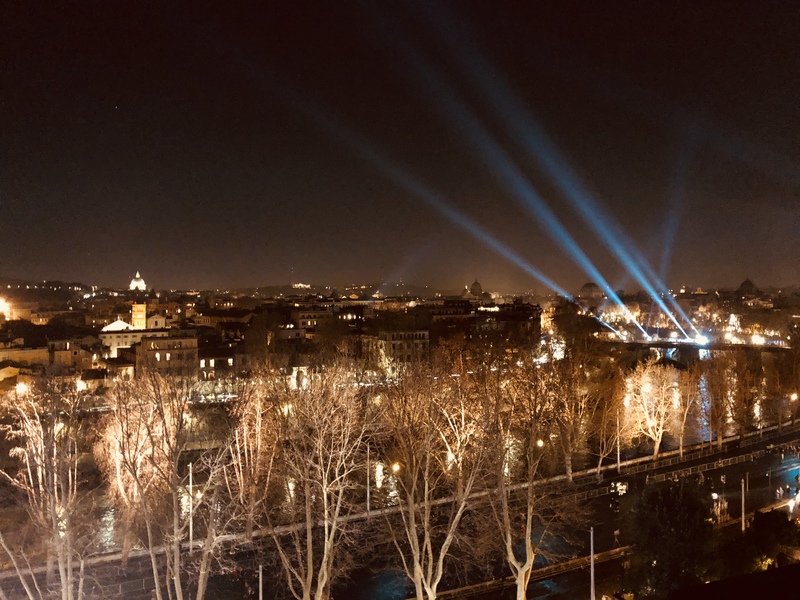 But right now, I am in awe of the beauty of this city, thanks in part to the New Year’s festivities, La Festa di Roma, I have been enjoying around the Tiber and the Aventine. Ponte Sublicio. 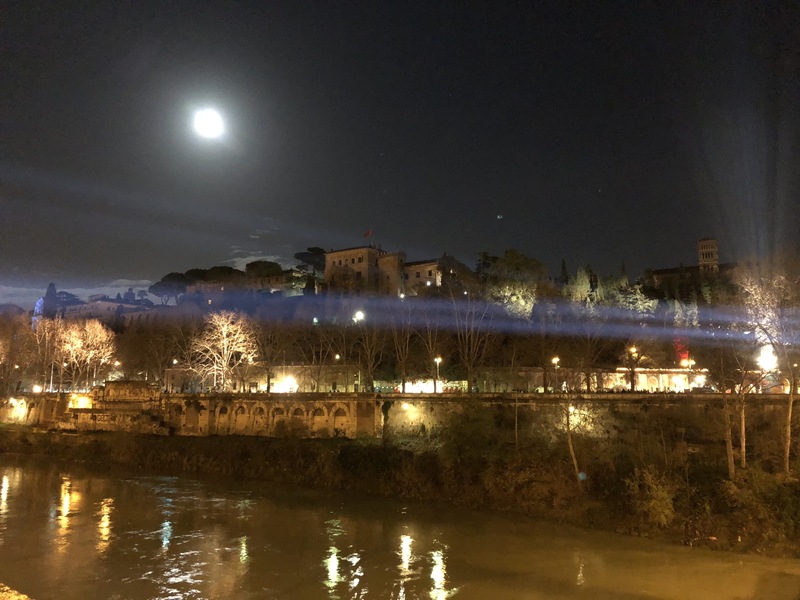 Spotlights strike laser lines upstream through the misty winter sky, playing off the full moon and Tiber reflections. The Lungotevere is car-free from Piazza dell’Emporio all the way to Via Arenula–really car free, not limited traffic with the occasional police car or politico careening through. Bands playing here and there, with small groups of spectators. 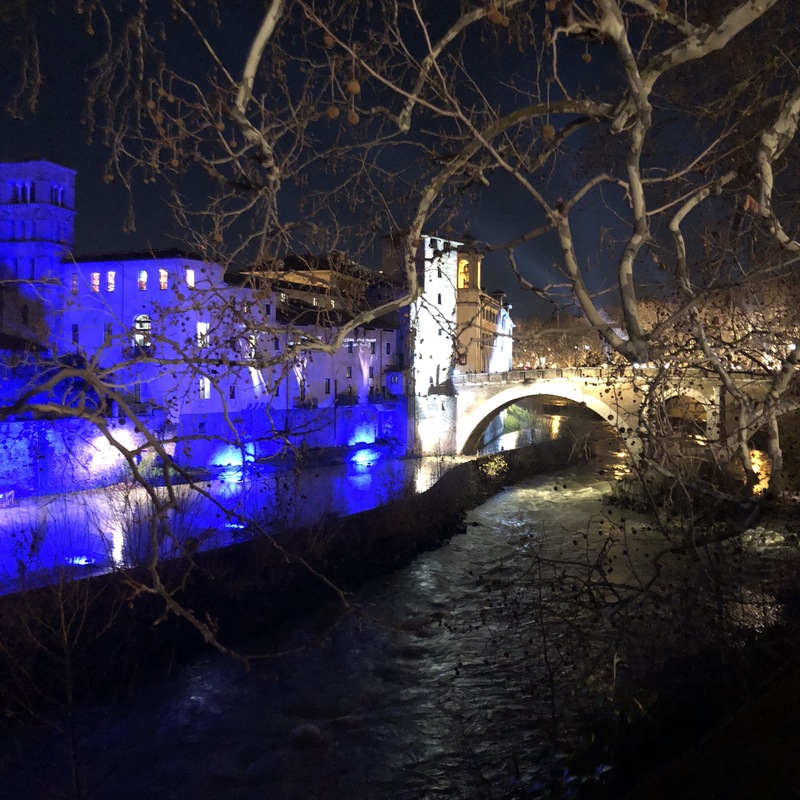 Walking along the riverside, music wafts toward me, lights illuminate spectacular vistas, but it doesn’t feel like a disco and it doesn’t distract from the spirit of place. 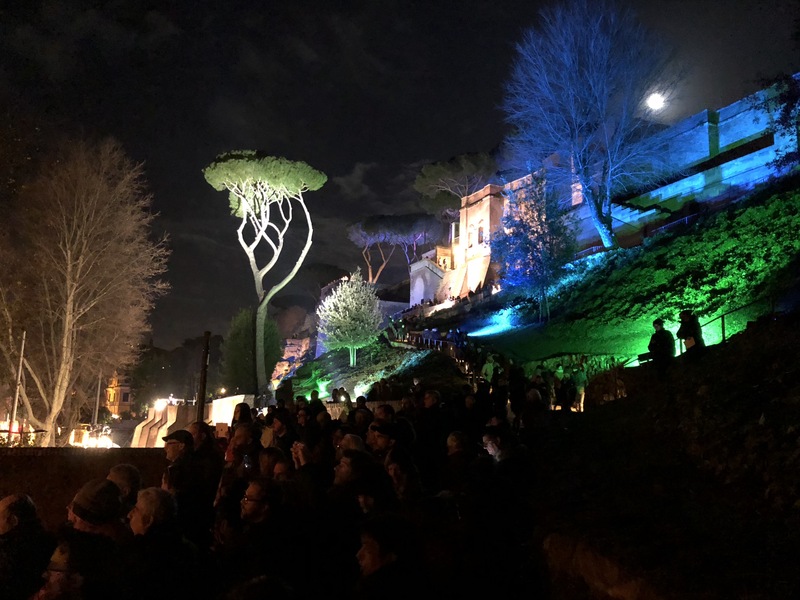 I climb the new path up the slopes of the Aventine for the first time since it was opened, again wondering why this new addition to Rome’s cityscape doesn’t get more attention. It’s usually hard to reach because it is impossible to cross the Lungotevere at this point without being run over, but tonight the route up to the Giardino degli Aranci was accessible to all (that is all who could climb the stairs). Above, overlooking Rome, other bands were playing under the pines and orange trees. Suspended above the piazza was “Day Hole” a video installation with a disk of daylight sky, playing nicely off the same-sized moon. The taranta pizzicata band Canzoniere Grecanico Salentino rocked, while nearby Opera Camion waxed lyric. 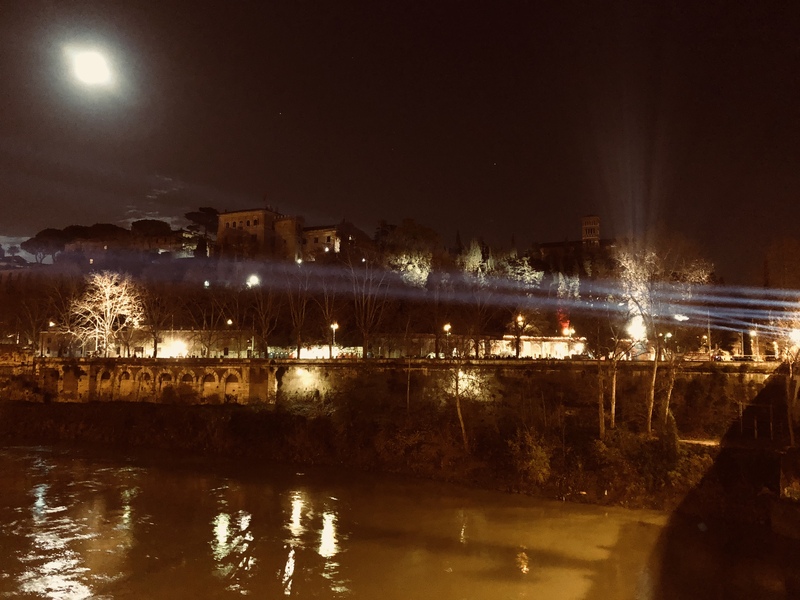 Finally, returning to the Tiber, projections onto the Tiber Island, along with devastatingly beautiful illumination of Ponte Sisto, convinced me that this event is the best thing to come to Rome since Triumphs and Laments. I realize this is only an “event”, and can’t be repeated frequently. But like any event, it can serve to shift citizens’ preconceptions about the city. 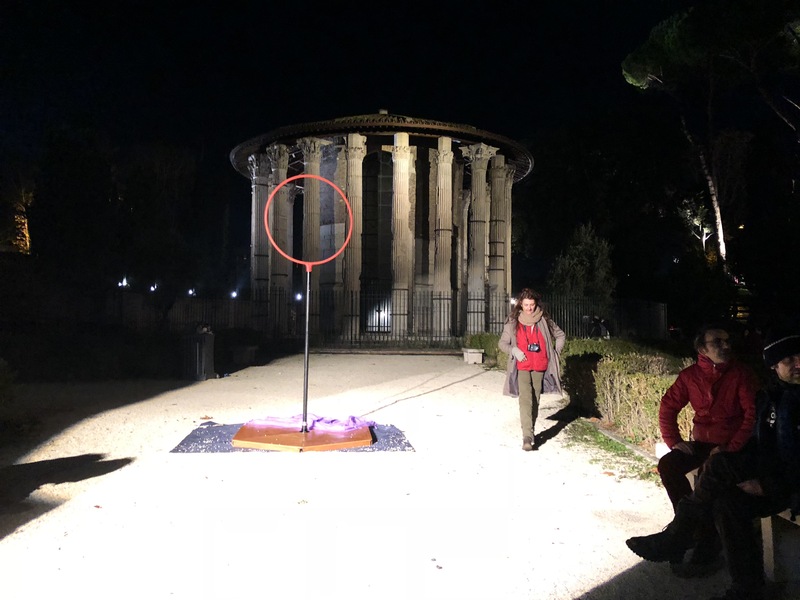 Don’t Rome’s urban treasures lend themselves to contemporary practices? Isn’t a distributed strategy for cultural, in different sites, scheduled across a span of time, aimed at diverse audiences, better than mass tourism? Isn’t public space better without cars? Congratulations Rome. If you could pull this off, I’m hopeful you can pull off the daily challenges of making the city civil again in 2018.